But don’t expect overnight success. Like learning to read and write or ride a bike, healthy eating is a process that takes time. 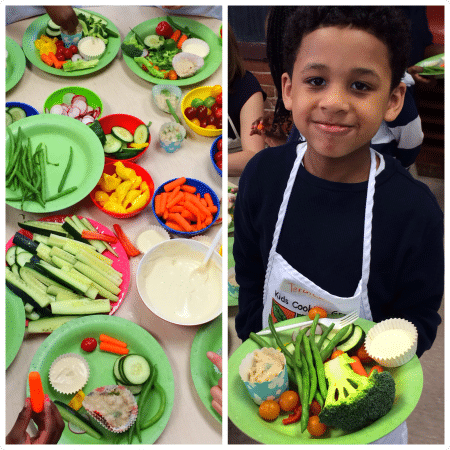 With an eye toward grounding kids in the importance of fresh, local ingredients comes Kids Cooking Green! 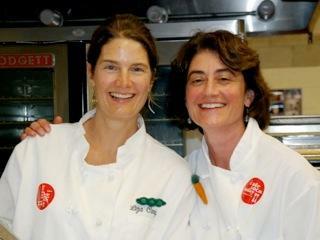 In 2007, Lori Deliso and Liza Connolly, two Lexington moms concerned about the lack of “real” foods in kids’ diets and the desire to teach children about the benefits of eating locally and sustainably, cooked up a five week after-school program called Kids Cooking Green. “Anbody hungry yet?” Lori Deliso asked. The Thoreau students chorused “Me!” as they gathered in the school’s cafeteria kitchen to learn how to “bread” chicken with cornflakes. Our guest editors for this issue of the Network News are the wonderful chef-educators from Kids Cooking Green in Lexington. 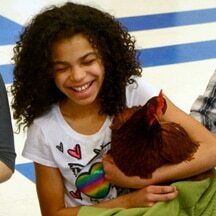 KCG is a fantastic example of the programming possibilities that emerge at the intersection of local food, curious kids, and dedicated educators. If you would like to be a future guest editor, please contact Erika at Mass. Farm to School Project to hear how it works. 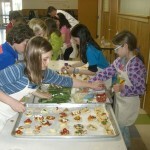 Read on for a profile of KCG, a delicious fall recipe, links to many upcoming farm- and food-related educational events (including an October Network gathering at Moraine Farm), and opportunities for educating Massachusetts students about their food, their landscapes, and their communities. “A group of fourth and fifth-graders seized control of the Columbus School cafeteria last Friday, preparing a home-cooked meal for their families under the tutelage of a local chef. Be sure to check out the great video! “The activity in the kitchen is dizzying: tablecloths are being spread, places set, drinks poured, centerpieces … centered. Behind the kitchen door, steady hands put the finishing touches on dinner, tossing local greens with Brussels sprouts and dried cranberries and sprinkling scratch-made spinach and egg pasta with fresh Parmesan. Cranberry oatmeal cookies, just taken from the oven, are placed on trays. 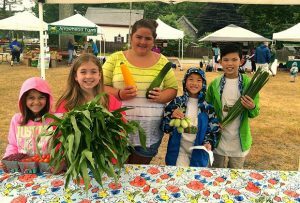 HEALTHY LESSONS: Lori Deliso of Lexington is in her sixth year helping direct Kids Cooking Green, a hands-on, educational outreach program of the Lexington Farmers Market that teaches students how to select locally grown food and then prepare it in the kitchen. A recent award from All-Clad Metalcrafters, in conjunction with Share Our Strength and Partnership for a Healthier America, enables participants to prepare their creations on professional grade equipment. Each of the five donated cookware kits includes an induction burner, saute pan, two smaller sauce pans, mixing bowls, measuring cups, a cutting board, knife, tongs, and utensils. Local classes take place in Arlington, Bedford, Lexington, and Wellesley, as well as Medford and Wilmington. “Kids, start your blenders! 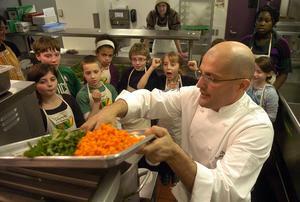 Organizing a party for 55 hungry guests is no easy task, especially when you are 10 years old! Throw the challenge of having the menu consist of only foods that are grown locally, and the fact that the menu must be nutritionally balanced and you have a real life challenge. 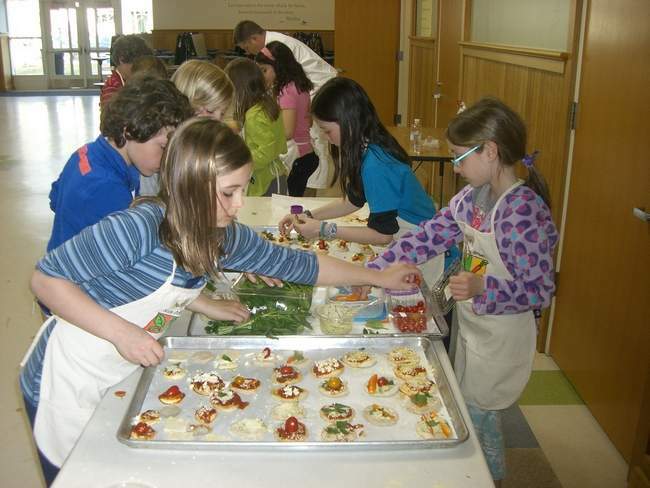 The students are part of a 4 week, after school Recreation Department Program called Kids Cooking Green, held at the Job Lane Elementary School.